Did you know that in the last ten years of pojo’s yearly top 10 lists, only five trap cards have made the list? And what’s especially extraordinary is that two cards made the list for 2013, which means 6 of the last 10 years didn’t have a single trap card make the top 10. So when a trap card makes the list, it’s an unusual event and marks something truly remarkable to make up for the inherent slowness of the card. Evenly Matched meets the criteria with a series of unique effects that have probably had the most impact on making the opponent think about their strategy since the dominant days of Mirror Force. It’s a card that meets the expectations of the current game. When it’s your turn, if you haven’t made ten different actions before your battle phase, you’re probably playing wrong. It’s the natural progression of the meta. You put all your plays out on the board because you’ve probably generated enough plusses to replenish your hand anyway. Well, Evenly Matched takes advantage of that, forcing the opponent to lose work on the field. Then, the opponent will have the same opportunity if he has an Evenly Matched in hand. Much like Wavering Eyes before it, this trap card deals with the now and was built for the modern era, a check against overextending. And Evenly Matched actually has a nifty restriction built into it. By only being able to work at the end of the battle phase, it doesn’t become an egregious misuse of power. Rather, it forces the opponent to consider the consequences beforehand. Much like Mirror Force did 10-15 years ago, the opponent must make a decision that could cost him the game. That’s a really good thing for a game often accused of being mechanical and devoid of true strategy. Evenly Matched will probably be a permanently restricted card, a card unworthy of being banned because it’s just a single card with no combos, but too powerful to stay at 3 for long. Its potential therefore, is good, but not the best. Evenly Matched is vicious, period. With Maxx C at 1, this seemed like the only thing that can check players from popping off and trying to OTK. This card will even the playing field and, when banishing, banishes face-down, preventing banish effects from triggering. If you have no cards, this becomes live in your hand, making it the literal definition of a hand trap. This off the first turn is devastating for a player to come back from: you go off and plus, set up your field to dominate, then your opponent enters their Battle Phase, ends it, playing this, and boom! You’re back to square one with no advantage gained from the bomb going off on your field. This card can be splashed into any deck and gain advantage for them. The number 8 slot on this Top 10 is a Trap that very recently came out in Circuit Break, and has quickly become one of the best Trap cards in the game, especially for the side deck, Evenly Matched. Evenly Matched has an advantage not many Traps have, and that is that it can be used from the hand if you control no other cards. What Evenly Matched does is at the end of the Battle Phase, if your opponent controls more cards than you do, they must banish cards face-down until they have the same number of cards as you do. So they are at least going to have 1 card left over, unless they make a mistake and try to MST negate this, lol. The other cards they chose not to keep are banished face-down as I already mentioned, and cards that are banished face-down are hard to get back. 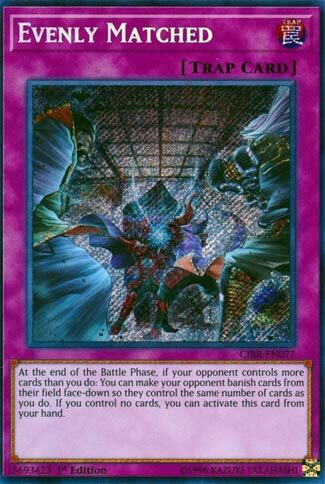 Necroface is one of the few cards I know that can do this, PSY-Framelord Omega can as well, but Omega isn’t for every deck since not all decks can Synchro Summon, and not many players use Necroface, so the cards this gets rid of are likely gone for the remainder of the duel. A very powerful Trap that can heavily punish the opponent for overextending without being able to go for the final kill. Play 3 in the main deck or side deck, whichever one is more fitting for your deck. Evenly Matched is the boss of Normal Trap Cards. It is perfectly balanced and useful in every deck. It has utility on the field and in the Hand. It is technically free to activate. This card was already recently reviewed, but I think I’m going to increase the score to perfect. The only thing that stops this is something that prevents banishing. Since this “boss” has no relevant counters and has insane long term potential it earns a spot on this list and a spot in every deck.